Open Forum: Discussion of Two Inspiring (short) Videos. Please come, if you like to sing or play music that lifts the soul, or if you just like to listen. No formality — the Circle is not for “performance.” It’s for the sheer enjoyment of offering music to the Divine, in yourself and in others. You are also welcome to just come and listen. "Reflection on Mahavakyas--Path to Self Realization"
Sri Sankaracharya picked four great statements from Upanishads for serious study and reflection by seekers of Truth. Swami Bodhannada expounds the inner meaning of these Mahavakyas (The Great Sayings) in a simple style for students of Vedanta. 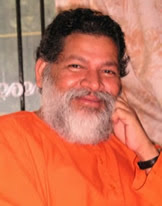 Swami Bodhananda is a speaker with a keen sense of observation. His knowledge of Vedanta is flawless and is acclaimed for his adaptive rendering of ancient Vedantic wisdom to the modern individual's needs and circumstances, helping people apply spiritual principles and practices to their immediate environment. In America, Swamiji has given numerous public forums, lectures and meditation sessions in Hindu temples, Christian churches, libraries, homes, businesses and universities. His theme has been to infuse modern society with spiritual values and the individual with the knowledge of his/her spiritual identity. A master of meditation, Swamiji adeptly blends his personal experience and knowledge of India's ancient wisdom tradition with modern studies in consciousness and psychology. Swamiji exemplifies the highest Vedantic ideals- outwardly active in the world while remaining inwardly detached. Vedanta Center Shrine decorated for a special worship service (puja). Great Teachers — in a series of stupendous promises — say Yes you certainly can. That will be Br. Shankara’s subject on Sunday. Please see our website Calendar for details for specific Sundays. Coffee, tea, snacks and continuing fellowship, following the forum, in the Monastery. Please join us! In the Chapel. Arati worship and silent meditation. For more information about these classes please visit our Classes & Activities FAQpage.